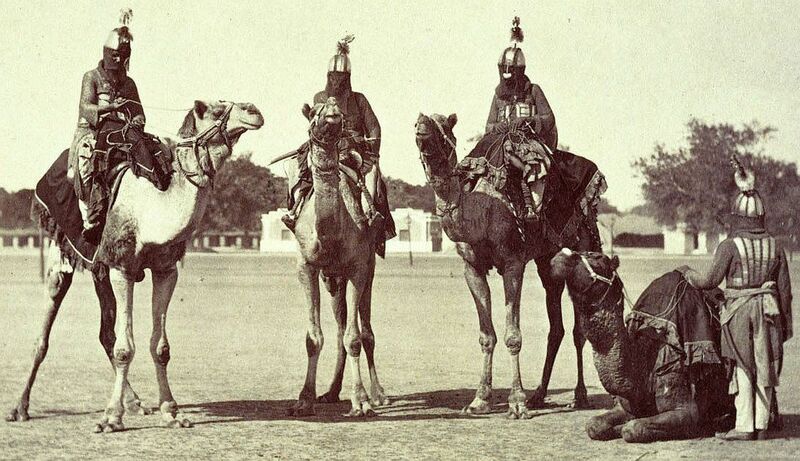 Thread: Period photos showing rarely seen types of arms and armor in use. 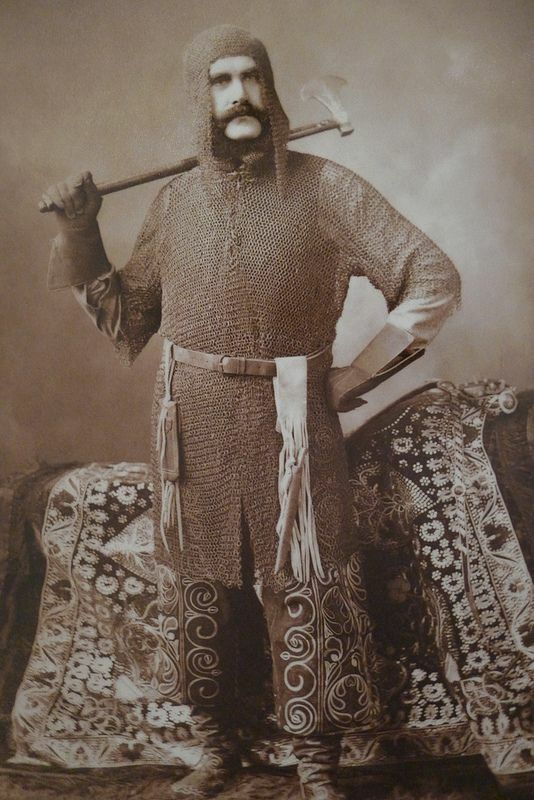 A few interesting period photos showing rarely seen types of arms and armor being worn. Some of the images have been newly created by editing individuals from larger group photos. 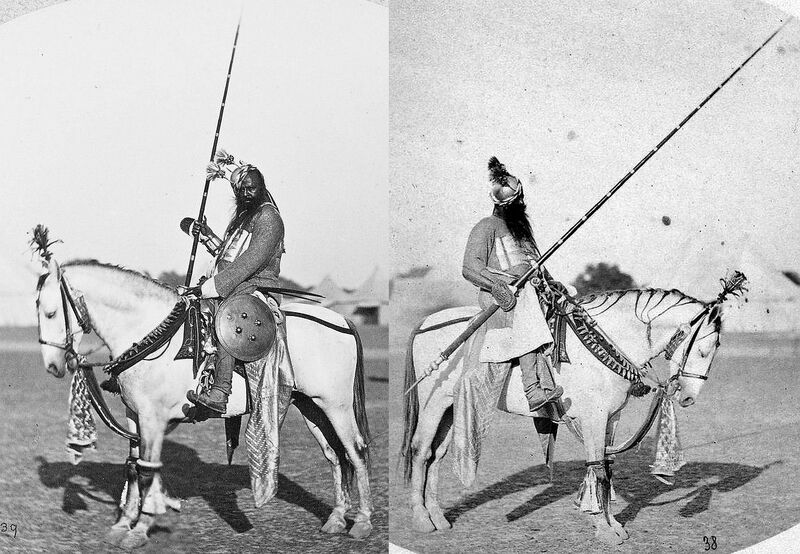 Indian Kuttuk horseman in armour (helmet / coif with mail aventail, mail shirt / hauberk, bazu band arm guards). The Khuttuk clans inhabit a tract of hilly country lying south and south-west of Kohat, and including spurs of the great Sooliman range from Dullun, on the Upper Koorum river, to Kooshalgurh, on the Indus, and from the Bungush valley of Kohat to the Wuzeeree lands in Bunnoo. 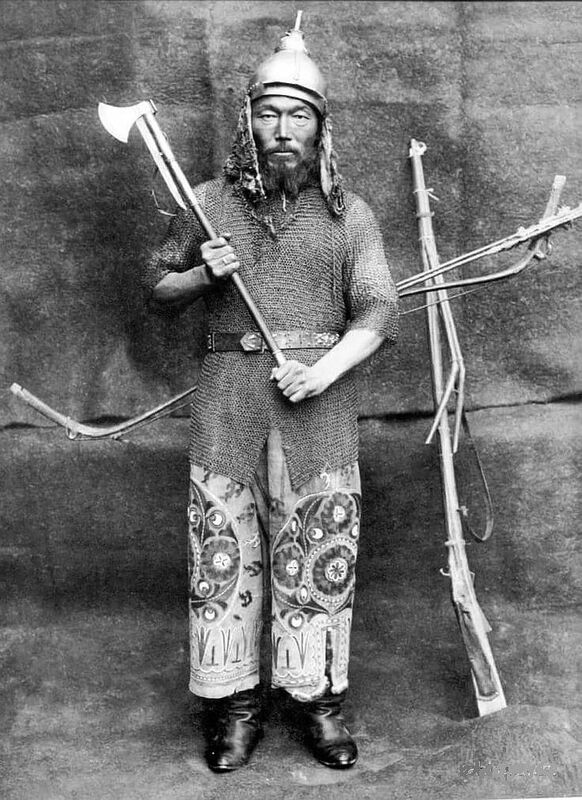 Kazakh warrior wearing a helmet with mail aventail and mail hauberk, he is holding an axe, a matchlock and bow are in the backround. The Kazakh Khanate was a Turkic Kazakh state, the successor of the Golden Horde, existing from 1456–1847, located roughly on the territory of the present-day Republic of Kazakhstan. At its height the khanate ruled from eastern Cumania (modern-day West Kazakhstan) to most of Uzbekistan, Karakalpakstan and the Syr Darya river. Rev. 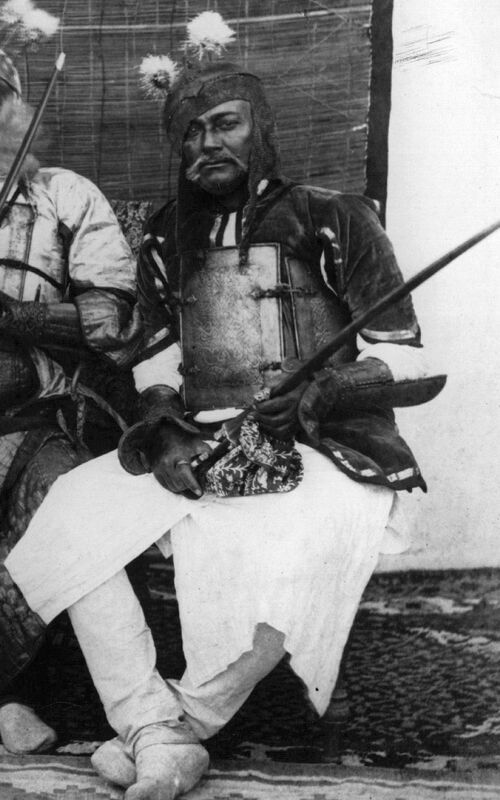 Henry Lansdell (1841-1919) in khokand chain armor (coif and hauberk), holding an axe (tabar), with saddle cloth presented by the Emir of Bokhara. Rev. Henry Lansdell author of "Russian Central Asia, including Kuldja, Bokhara, Khiva and Merv", 1885. 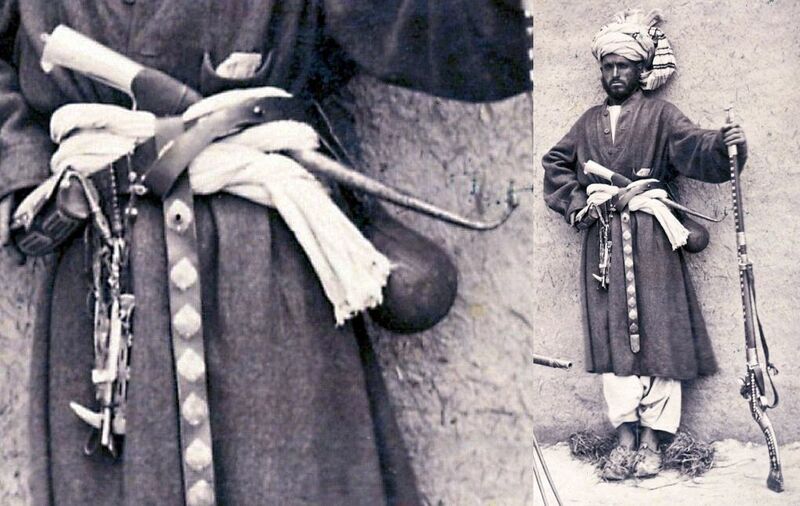 (The only period photo I am aware of showing an Indo-Persian war hammer) Ottoman Syrian Bedouin with rifle, pistol (kuber), holding a heavy steel war hammer (kulunk), wood shaft, the head is curved and pointed on one side, widened on the other side in the form of an anvil. From:Les costumes populaires de la Turquie en 1873, 74 photographic plates by Pascal Sebah, published by the Imperial Ottoman Commission for the "Exposition Universelle" of Vienna in 1873. 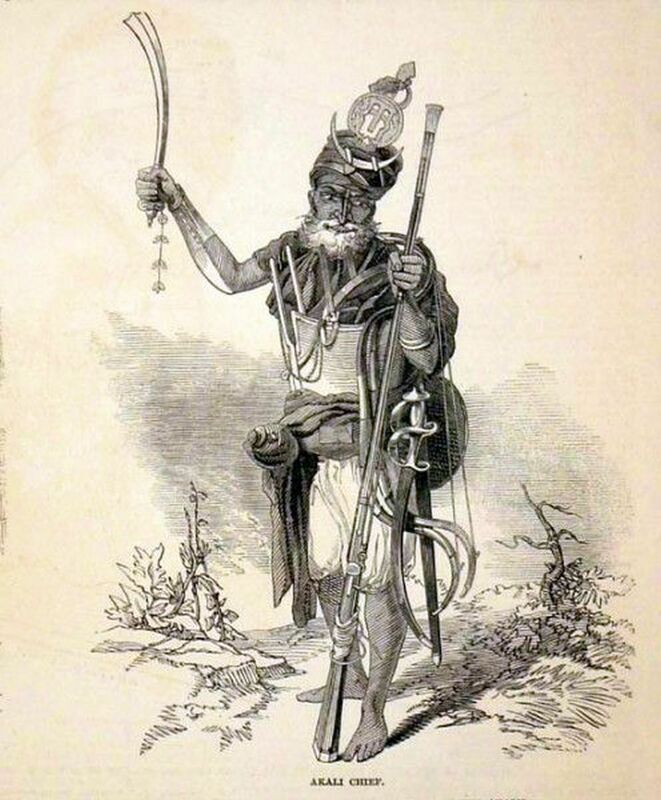 Christian mountain dweller of Zgarta (Ottoman Syria), armed with a "topouz", a heavy wood mace bristling with iron points and a yatagan thrust through his belt. From:Les costumes populaires de la Turquie en 1873, 74 photographic plates by Pascal Sebah, published by the Imperial Ottoman Commission for the "Exposition Universelle" of Vienna in 1873. 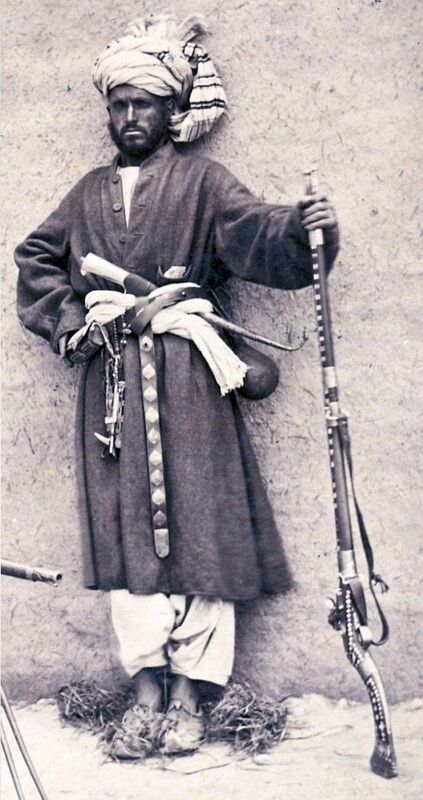 Ottoman Arab Zobeid holding a topouz (mace) with a stone head and a wooden shaft, a Jambiya dagger tucked into his bandolier. From:Les costumes populaires de la Turquie en 1873, 74 photographic plates by Pascal Sebah, published by the Imperial Ottoman Commission for the "Exposition Universelle" of Vienna in 1873. (Black Sea yatagan / laz bichaq) Ottoman Laze, their territory, Lazistan, was part of the former kingdom of Pont and the small Byzantine empire of Trebizond. 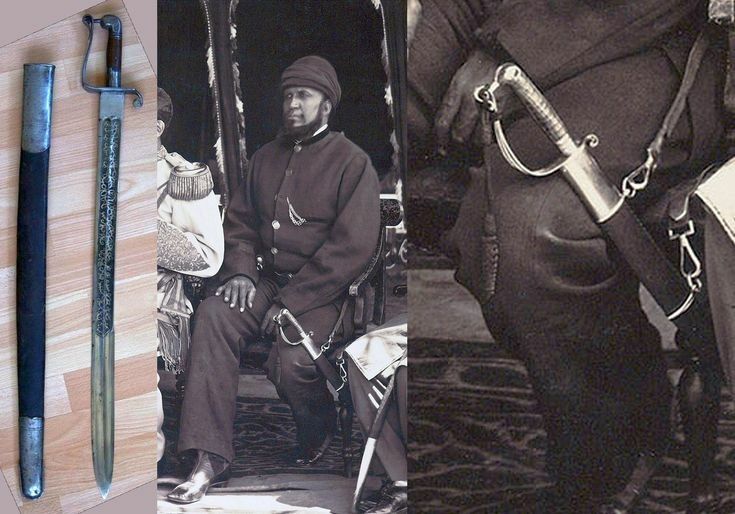 Shown with a Black Sea yatagan (laz bichaq) and a rifle. From:Les costumes populaires de la Turquie en 1873, 74 photographic plates by Pascal Sebah, published by the Imperial Ottoman Commission for the "Exposition Universelle" of Vienna in 1873. Some images of Indian char-aina cuirass being worn. 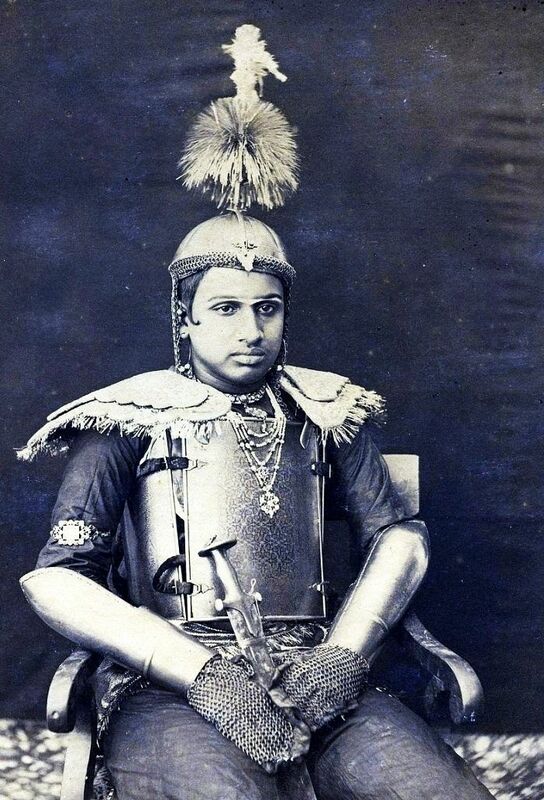 Kishan Singhji, Rawat of Bijolia c1870s, wearing full protective armour, gold damascened 4-piece char aina cuirass body armour, secured with leather straps, ensuite damascened dastana arm guards with mail gauntlets, padded shoulder protective epaulettes, kula khud helmet with camail and sliding nasal, surmounted by horse hair spray and peacock feather finial, and jewelled necklaces with pendants and he carries the traditional Rajput tulwar sword. 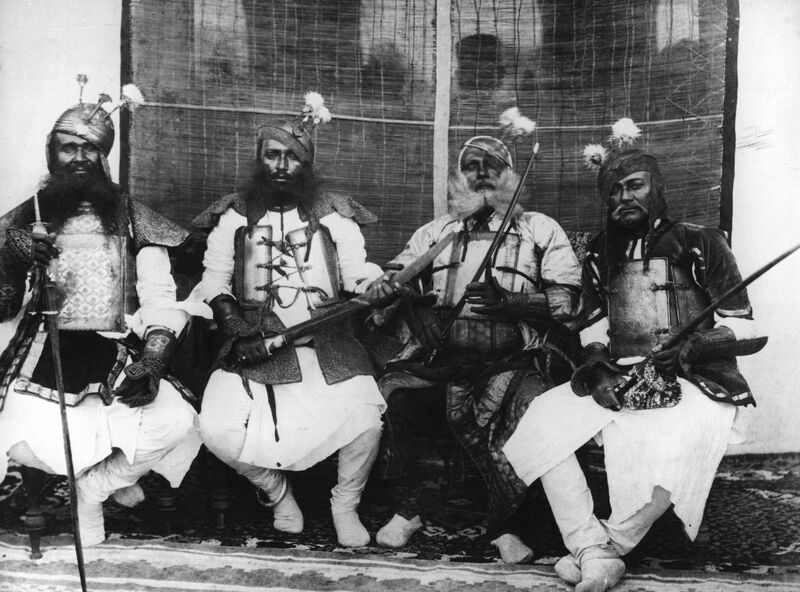 India, 1873:The attendants of the Sumptha Raja at the Agra Durbar, wearing char-aina (cuirass), kulah khud (helmet), bazu band (arm guards). A durbar was a great ceremonial gathering during the period of the British Raj. Here is a quote about the Agra Durbar from a book written in 1901, "The Agra Durbar was perhaps the most splendid and extraordinary to European eyes of the whole series, for there were seen the most powerful princes of native India in all their semi-barbaric magnificence." So interesting, thank you for sharing that ! Chahr Aineh is not under the vests, as we could imagine because we don't find some on persian miniatures. Originally Posted by Melisande B.
Melisande, can you clarify your statement, I would like to know exactly what you are saying about the wearing of Char-aina, thanks. 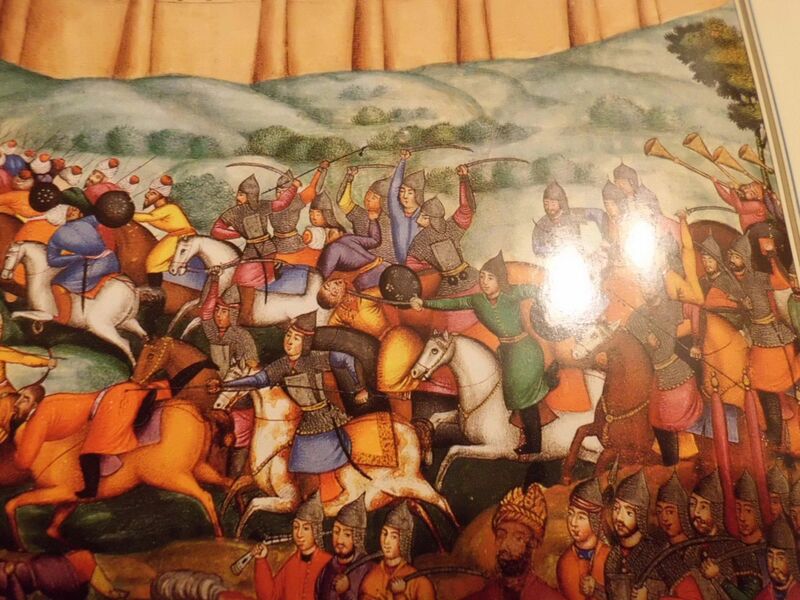 On safavid paintings, you can't see any chahar aineh. It is strange because chahar aineh seems to appear at this period, so scholars often say it is not visible on the paintings because of a coat on it. 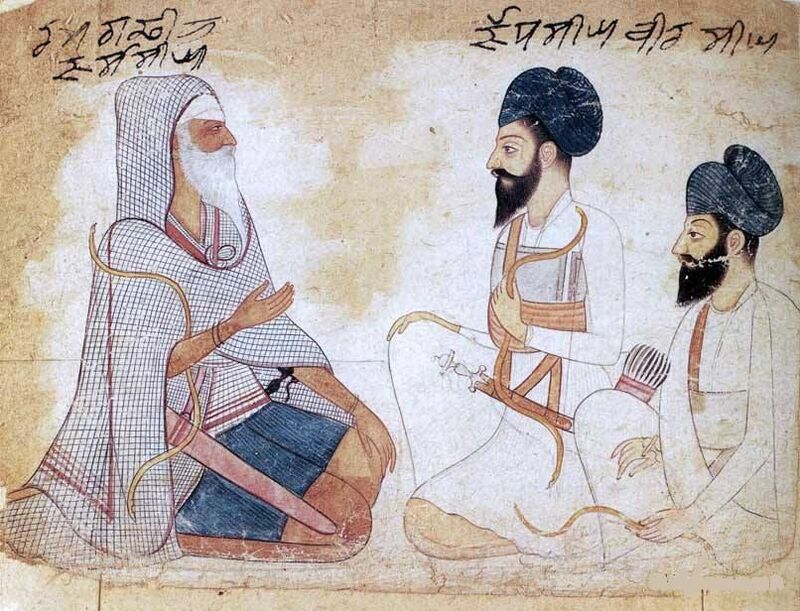 But on this pictures, you can see the chahar aineh is wear without a coat, and the is some visible also on a painted manuscript dated from the 18th c. So I am not sure the traditional statement of scholrs is real. Could you tell where did you find thiese interesting pictures ? (sorry for my bad english, don't hesistate to correct it). Last edited by Melisande B.; 03-30-2017 at 11:25 AM. I also have heard that armor was often covered up by clothing, and in period illustrations you can see heavy, long coats / shirts being worn. 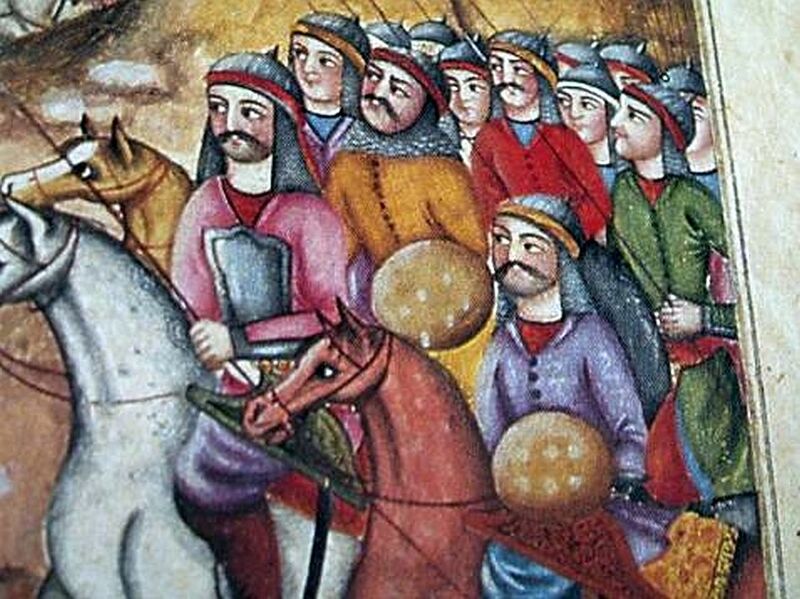 In Persian illustrations you do see bazu-band and helmets and sometimes you will see body armor but only very rarely will you see Persian char-aina being depicted. 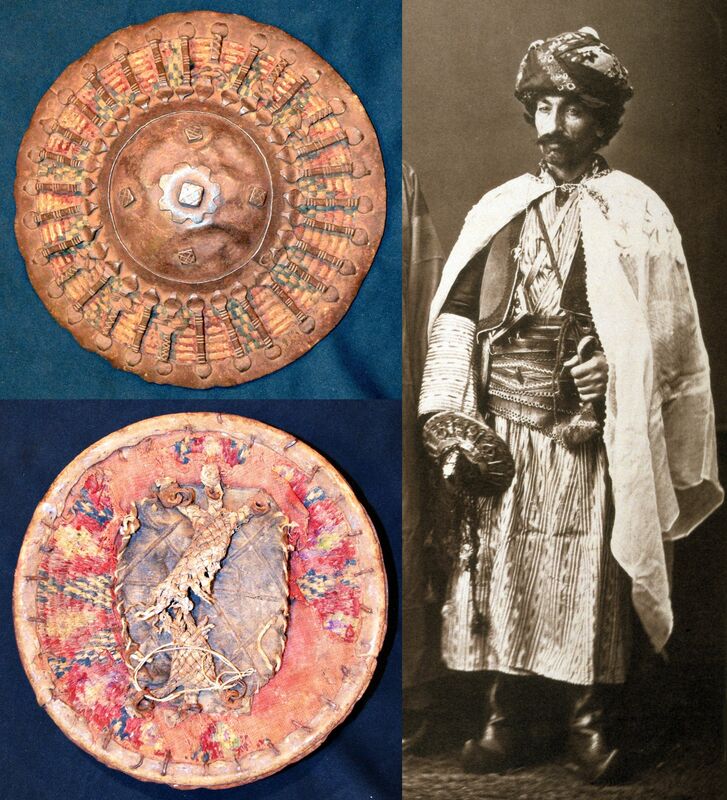 Existing examples of char-aina seem to indicate that Indian char-aina were worn by wealthy individuals and also by less wealthy as some Indian char-aina are highly decorated and / or made with wootz steel while other examples are quite plain. On the other hand, existing Persian examples tend to be highly decorated. I do not recall ever seeing a very plain Persian char-aina. 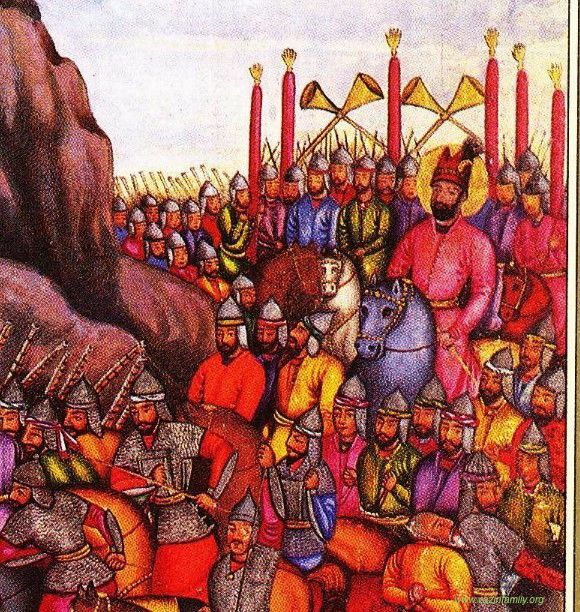 Also Persian use of armor in general ended much earlier than in India and yet even in Indian illustrations / photos etc very few Char-aina can be seen. Here are the only illustrations of Persian char-aina I know of. This example, cropped from a much larger Persian illustration owned by the Met Museum shows an archer wearing some kind of body armor, the image of a known Persian char-aina looks very similar to the armor being worn by the archer, no way of telling for sure but very close and it at least shows some type of body armor. This image is from the Tarikh-i Nadiri, A history of Nadir Shah Afshar, who ruled Persia from 1736 to 1747, written in Persian by Mahdi Khan Astarabadi (d. 1759), his secretary and court historian. It definitely shows a char-aina being worn in battle, several other armors are shown with at least a char-aina type plate. 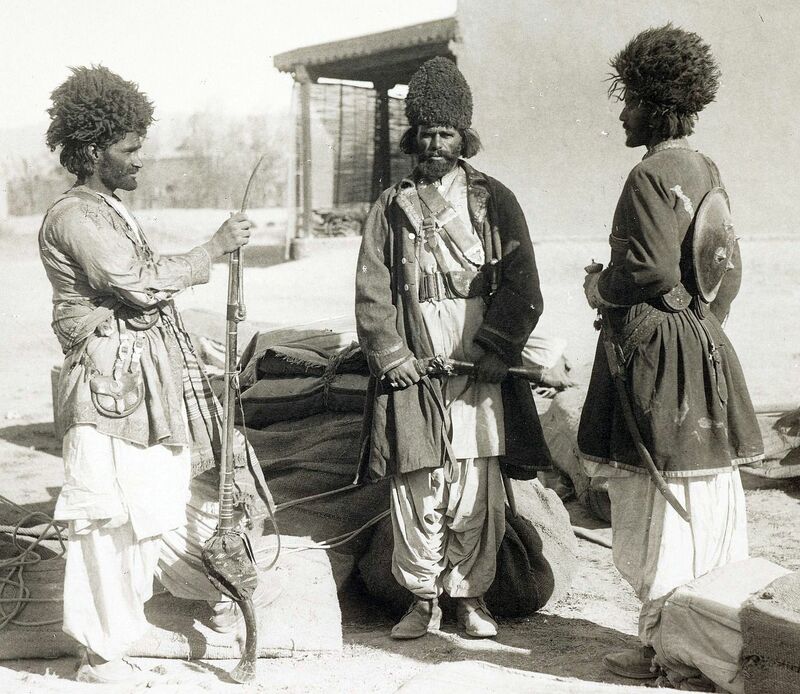 Here is another image showing a Persian char-aina being worn from the Tarikh-i Nadiri, mail shirts(hauberks) can be seen as well. The campaign of Herat. 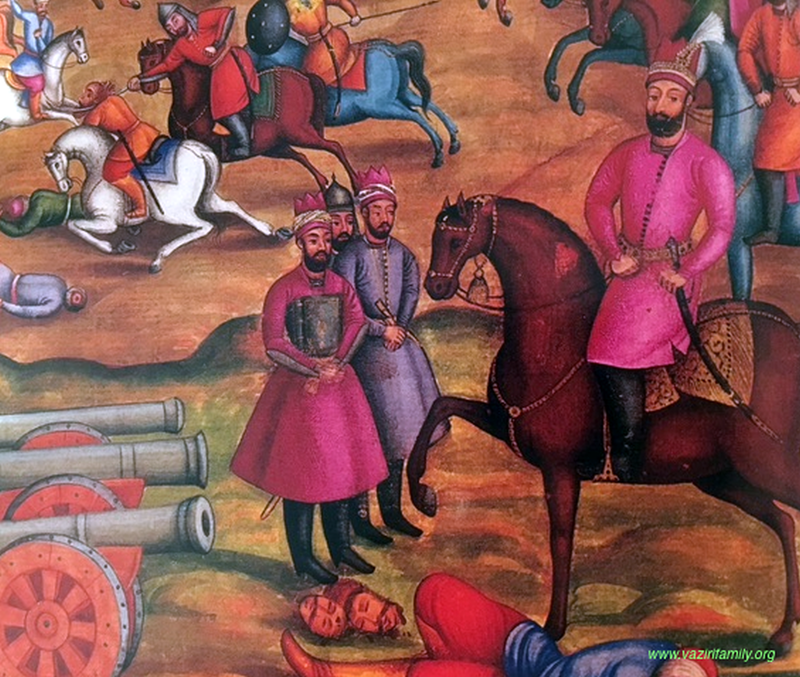 Nader Shah sits on the horse, and Mirza Mehdi Khan stands in red clothes in front of him. According to the Vaziri family, this image from the Tarikh-i Nadiri shows the campaign between Nader and Abdollah Pasha, the Ottoman general. The Persians have defeated the Ottoman army, and the corpse of Abdollah Pasha is on the ground at the feet of Nader’s horse. The Vaziri family says that the person standing next to Nader Shah ("Mirza Mehdi Khan") is holding a "book" against his chest. According to Dr. Manouchehr Moshtagh Khorasani it is a Persian char-aina and not book. Look at this Afsharid nobleman wearing a Chahr Ayne, you can see exact Safavid examples from the royal colelctiosn of Iranian museums. THis chahr ayne has four plates. This appears to show a Persian char-aina, from a 16th century copy of the Shahname according to Dr. Manouchehr Moshtagh Khorasani. Last edited by eric t; 06-16-2017 at 03:00 AM. 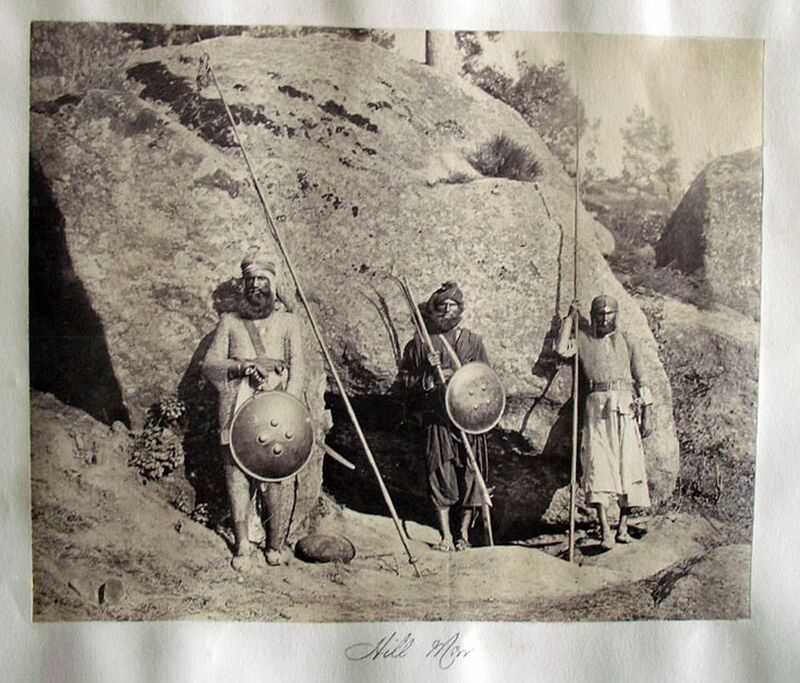 Indian hill men wearing mail armor and helmets. European knights and their horses often wore surcoats to cover their armour from the sun in hot countries. Metal can get very hot when exposed to the sun. The surcoats were decorated to help identify the wearers. This is true but....there are many period depictions of Europeans wearing armor despite the fact that at times armor may have been covered. In the case of Indo-Persian armor it seems as if there are relatively very few period depictions of armor being worn, especially body armor. 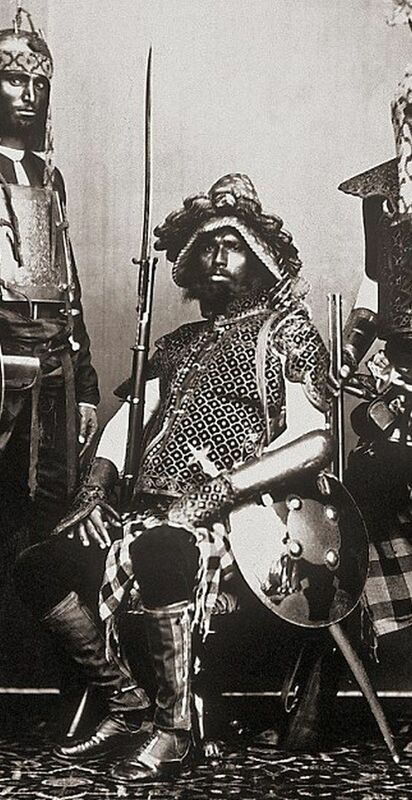 Ottoman Kurdish infantryman from Djoulamerk with kalkan shield made from lacquered hardened buffalo leather with a central iron dome, covered with gilded copper discs nailed in tight rows. 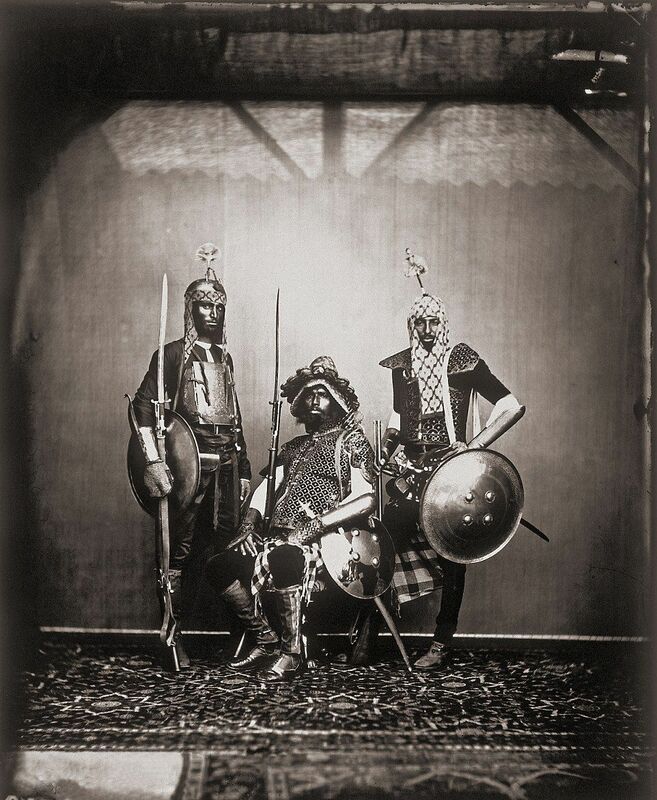 From:Les costumes populaires de la Turquie en 1873, 74 photographic plates by Pascal Sebah, published by the Imperial Ottoman Commission for the "Exposition Universelle" of Vienna in 1873. 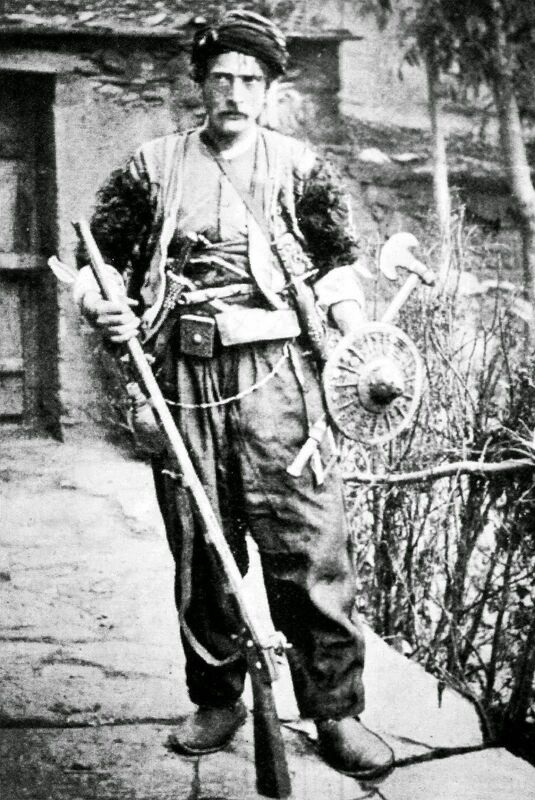 Ottoman Kurdish irregular soldier from Palu, wearing a silahlik (weapons belt) and holding a kalkan shield composed of concentric wicker attached by threads, the exterior made up of radial steel bars linking the steel frame to the steel domed center boss. From:Les costumes populaires de la Turquie en 1873, 74 photographic plates by Pascal Sebah, published by the Imperial Ottoman Commission for the "Exposition Universelle" of Vienna in 1873. 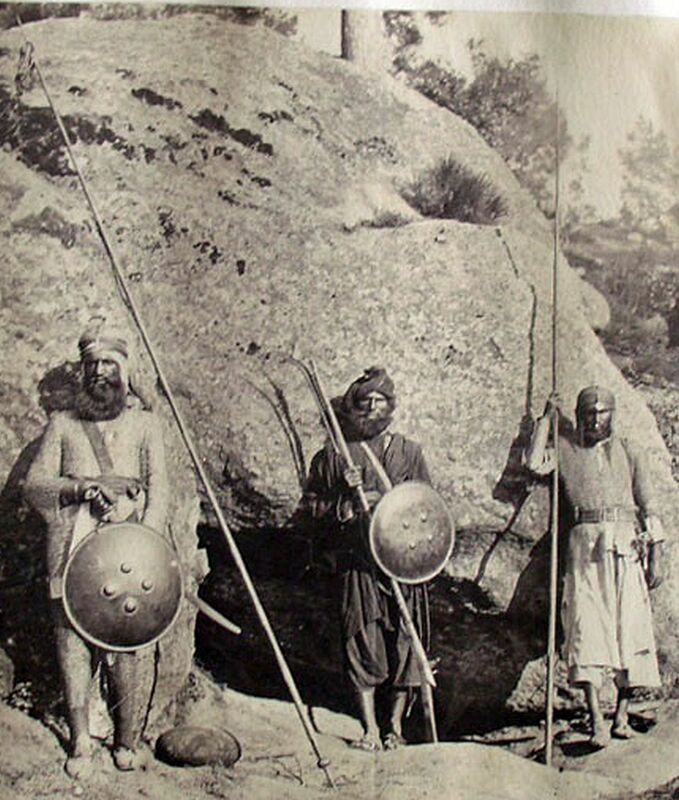 KURDS OF HAZON (MOUNT HAZON), 1894. 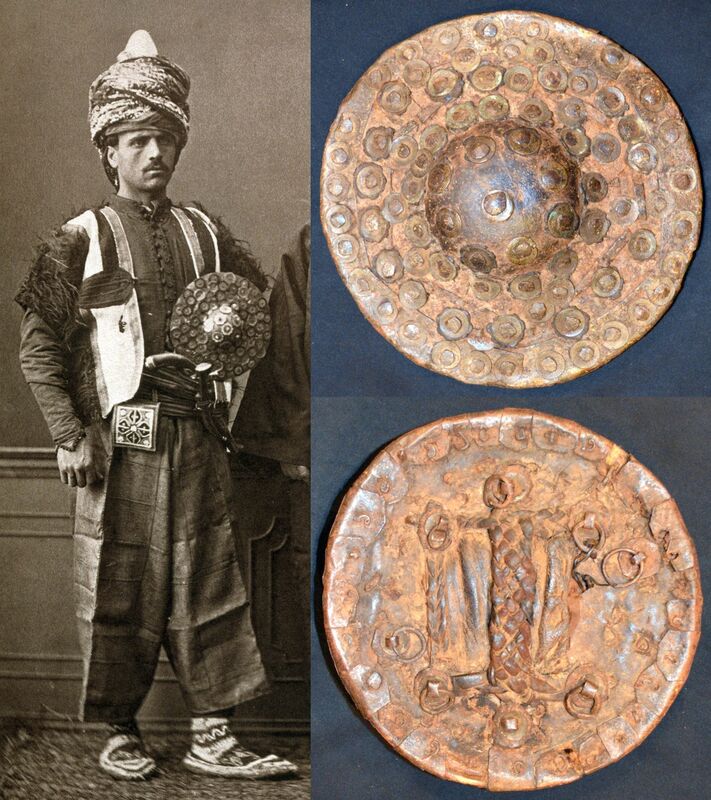 (The man on the left is holding an Ottoman kalkan shield). 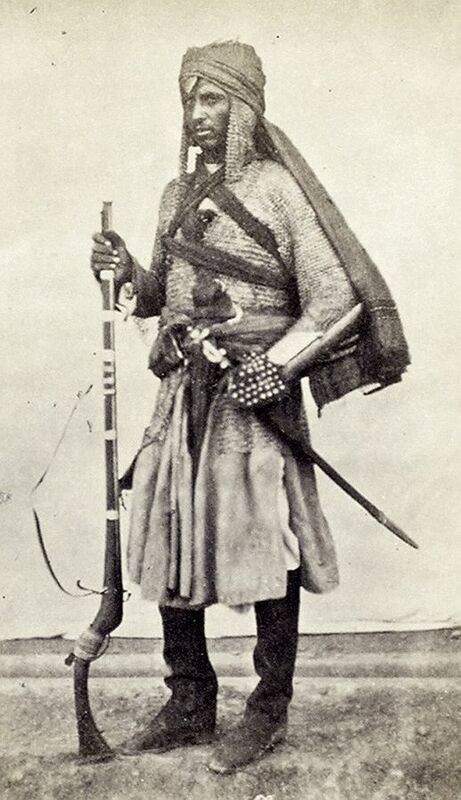 A fully armed Armenian mountain dweller. From the region between Van en Hakkari. Late-Ottoman era, end of the 19th century. Shown with rifle, axe and Ottoman type kalkan shield. Last edited by eric t; 06-17-2017 at 05:58 PM. I must admit I don't know much about Indo-Persian armour, but it seems to me that they favoured light armour and chainmail which could have been due to the climate. The air can circulate through chainmail. In addition there was perhaps a traditional emphasis on agility and speed? In Europe there was an emphasis on heavy armour from Germanic/Goth times (facilitated by the use of stirrups) and perhaps the cooler climate made its wear more tolerable? When the European knights fought in hotter climates they had to improvise by covering the surface of their armour with surcoats to prevent being roasted inside by the hot sun. They also covered their horses' armour. Indo-persian art may not depict wear of modest chest armour if this was concealed under a layer of clothing, but this is pure speculation on my part. 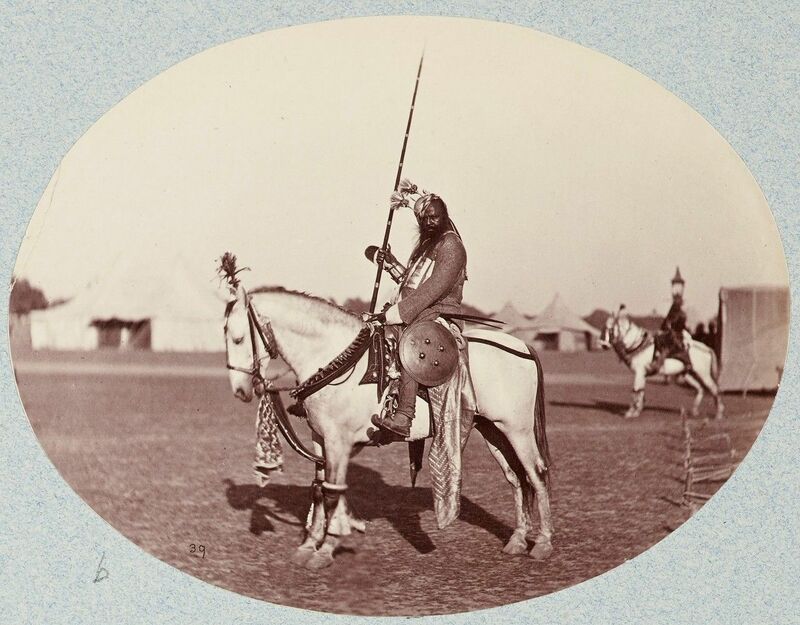 Here is something unusual, several months ago I found an image of a mounted Indian warrior with a tulwar sword, wearing mail and plate armor, helmet, and arm guards, he is holding a very long lance and there is a shield at his side. This photograph was on a Russian site, tonight I found an image of the same warrior taken from the opposite side. Below are the original photographs numbered #38 & #39. These images were obviously taken at the same time and were meant to be viewed together, somehow they became separated and basically hidden away, unseen and unknown for the most part. I created a brand new image from the two original images by cropping, editing and then combining the images together. 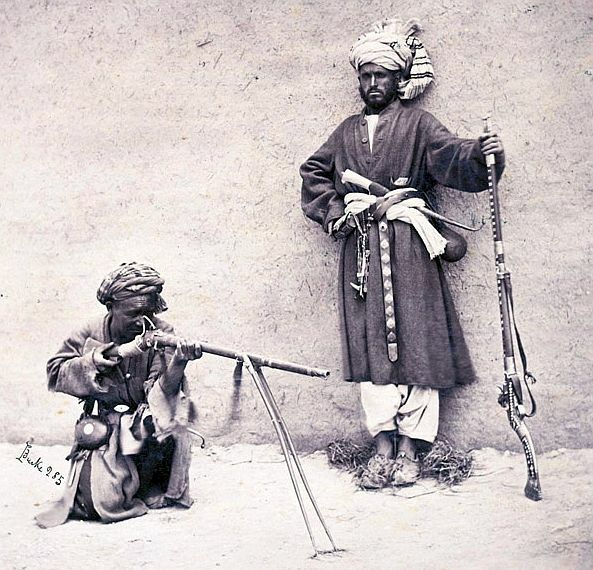 Here is another example of a newly created image, below is a photo of two Afghan soldiers with their matchlock jezails, taken by John Burke c.1879-80. One of the men has a large karud dagger in his belt. 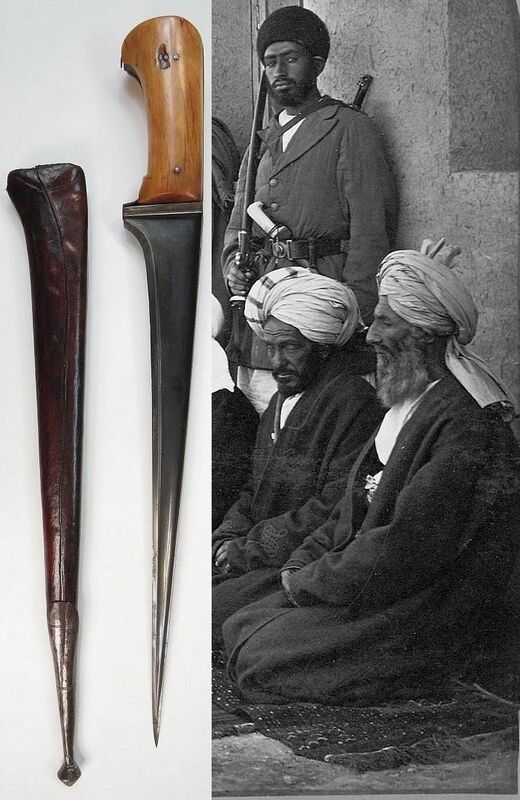 By cropping the original image and editing it I was able to highlight the karud dagger which is similar to the pesh-kabz dagger, the difference is that the karud dagger has a straight blade. Last edited by eric t; 06-18-2017 at 12:57 AM. Below is another example of a newly created image. 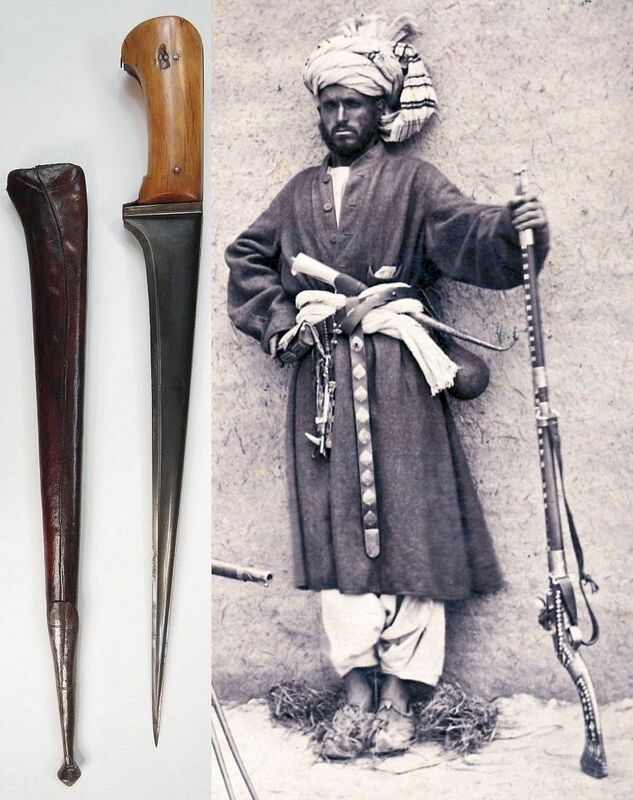 In this group photo is an Afghan with a large karud dagger in his belt. By cropping and editing the the karud dagger can now be seen clearly. 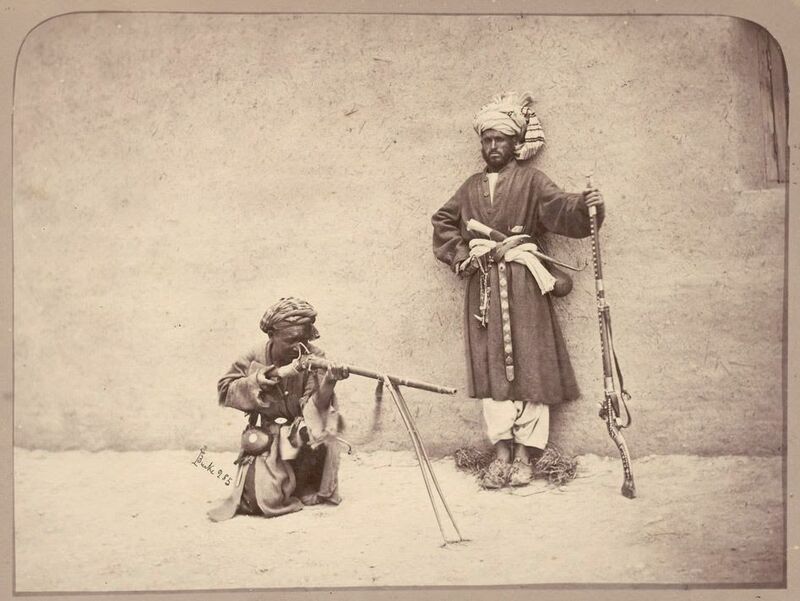 Portrait of Afghan chiefs probably taken at Kabul, Afghanistan, by John Burke in 1879-80. Burke was the most intrepid of all the photographers active in Victorian India. He travelled widely in the sub-continent but is best known for his work pertaining to the Second Afghan War (1878-80). In this two-year campaign, he worked steadily in the hostile environment of Afghanistan and the North West Frontier Province (now in Pakistan), recording the military events, the topography and the people of the region in which the strategies of the Great Game (concerning the Anglo-Russian territorial rivalry) were played out. 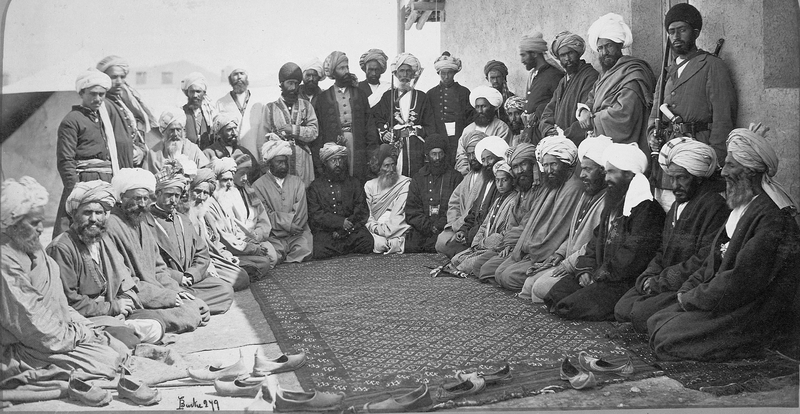 Burke also photographed a number of the darbars or meetings that took place between the British leaders and Afghan chiefs which led to the uneasy peace treaties characteristic of the campaign. 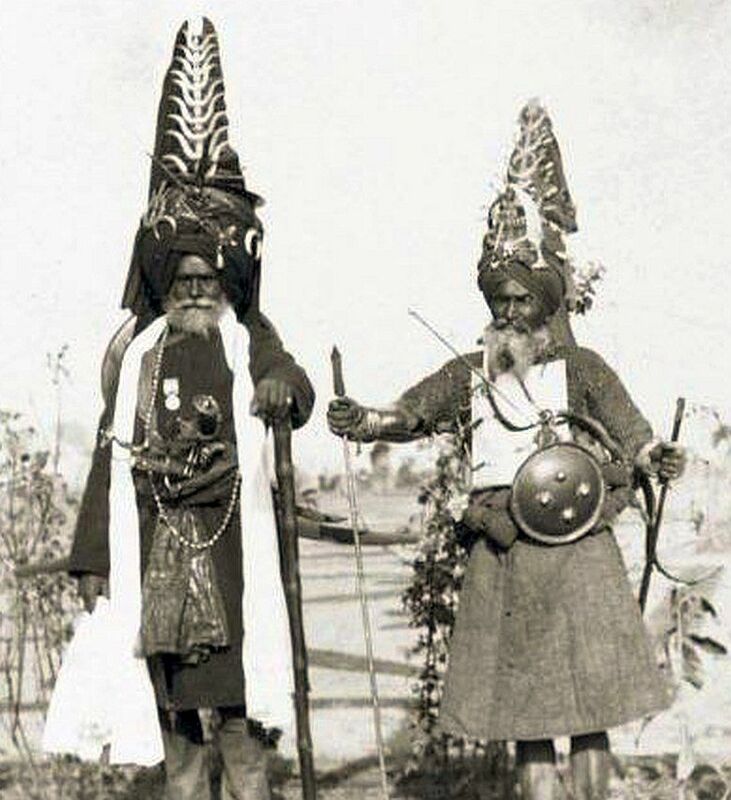 Afghan Warriors (1895), Fred Bremner set up his studio in Karachi and another in Quetta, the growing capital of the province of Baluchistan, he travelled across the province, following the newly laid railway tracks, to the very north-western edge of British India, on the border of Afghanistan. In his memoir he wrote of his encounters there: "There is nothing the Baluchi and Afghans value more than to be armed with a gun". (shown with jezail matchlock rifle, blunderbuss, shield and pulwar sword). 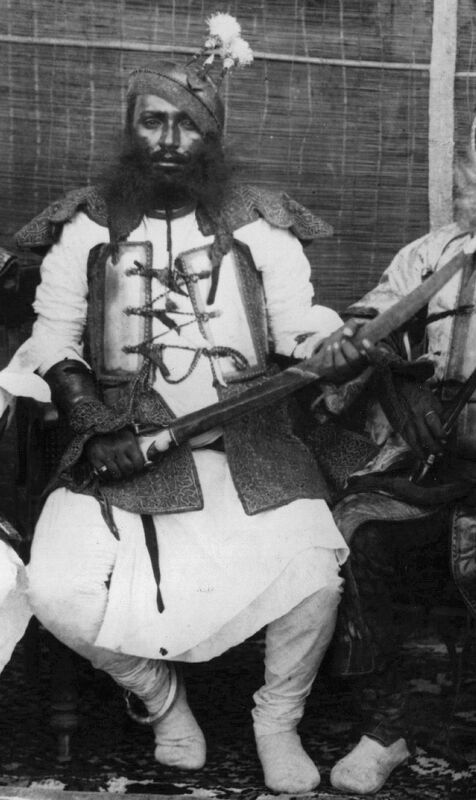 Tribesmen from NW frontier, India, with flintlock blunderbuss, late 19th to early 20th century. 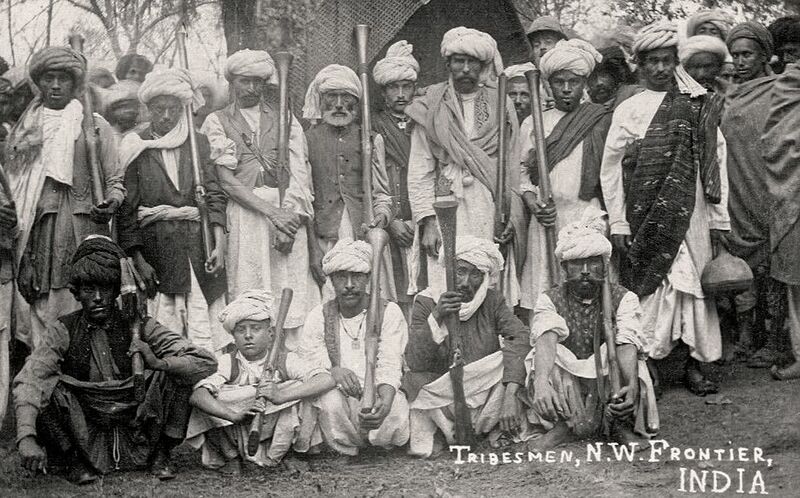 Pathan (Afghan) Tribesmen - North West Frontier Province. On the reverse of this postcard, a British officer has written "These are the hillmen we have to contend with"! Spot the cheeky British soldier sneaking into the shot. The North-West Frontier is now the border region between Afghanistan and Pakistan. (shown with blunderbuss long guns). Last edited by eric t; 06-20-2017 at 11:17 AM. Many thanks for this thread a real Eldorado in this rare field!!!!! I agree, thank you very much Eric. 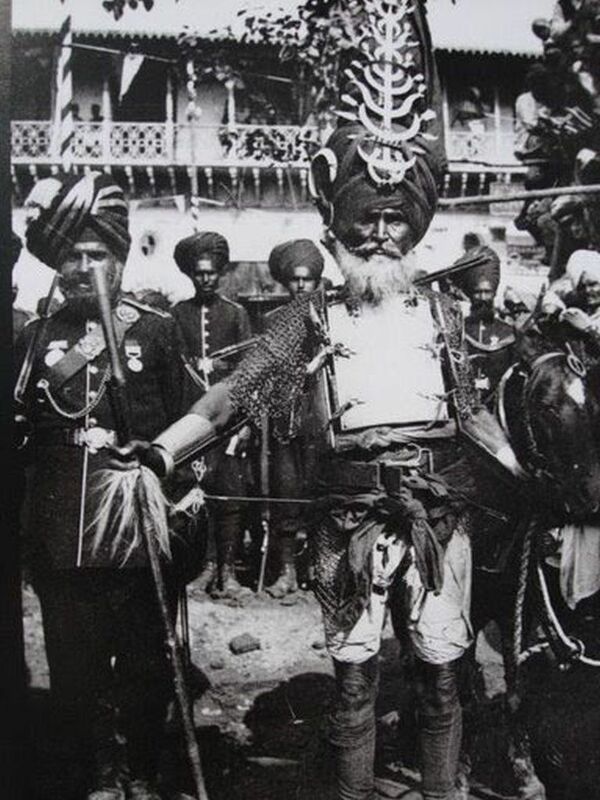 An amazing photo showing the guard of Maharajah Ram Singh III, in the Royal Palace of Jaipur, 1858. 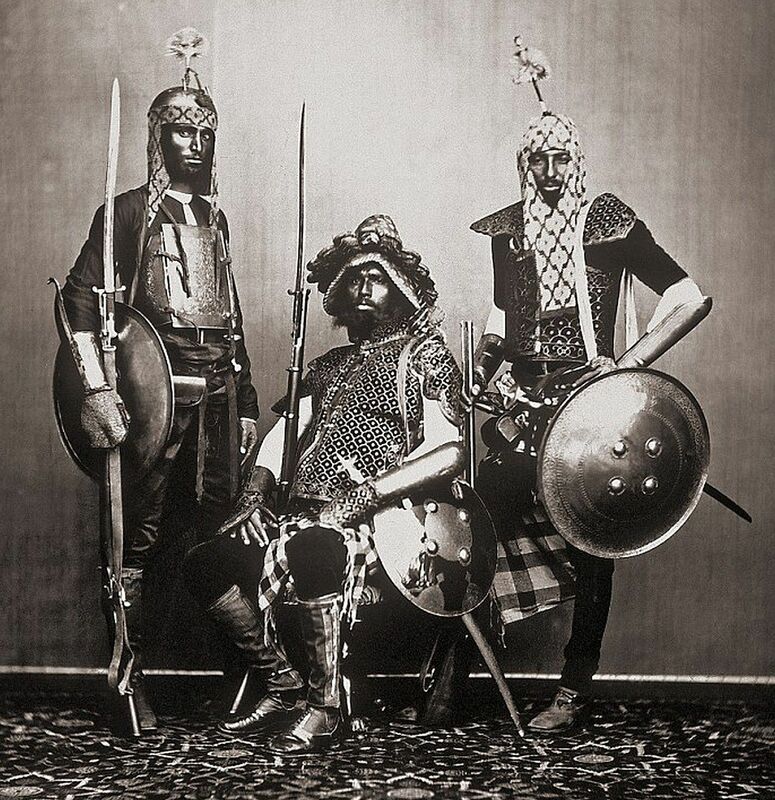 Shown wearing various type of Indian armor including char-aina cuirass, chilta hazar masha (coat of a thousand nails), dastana / bazu-band arm guards, khula khud helmets and dhal (shields). 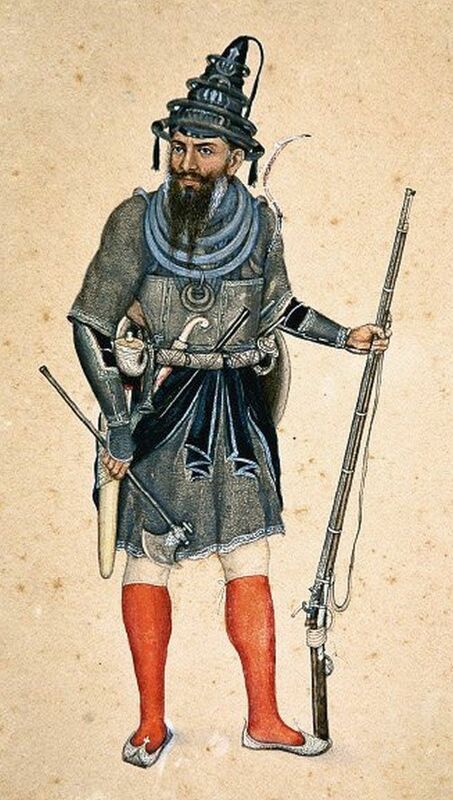 Ottoman man from Diarbekir, shown with an axe (tabar) and wearing a silahlik (weapons belt) that holds a pistol (kuber). From:Les costumes populaires de la Turquie en 1873, 74 photographic plates by Pascal Sebah, published by the Imperial Ottoman Commission for the "Exposition Universelle" of Vienna in 1873. Last edited by eric t; 07-02-2018 at 10:52 PM. 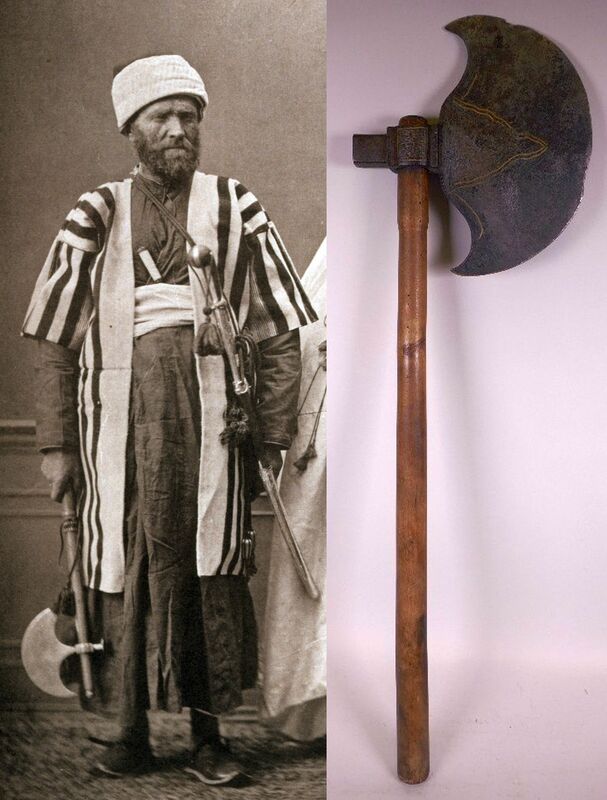 Druse of Ottoman Lebanon, holding an Ottoman balta axe and wearing an Ottoman kilij sword. 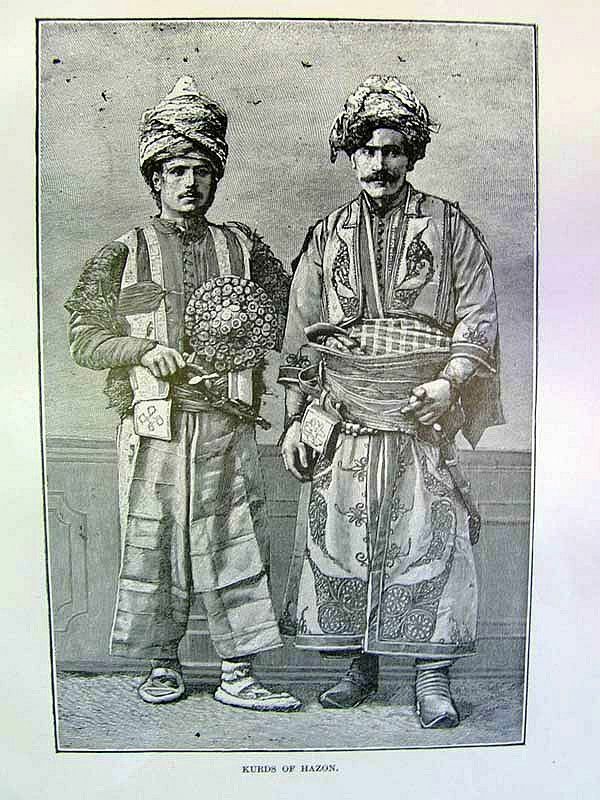 From:Les costumes populaires de la Turquie en 1873, 74 photographic plates by Pascal Sebah, published by the Imperial Ottoman Commission for the "Exposition Universelle" of Vienna in 1873. 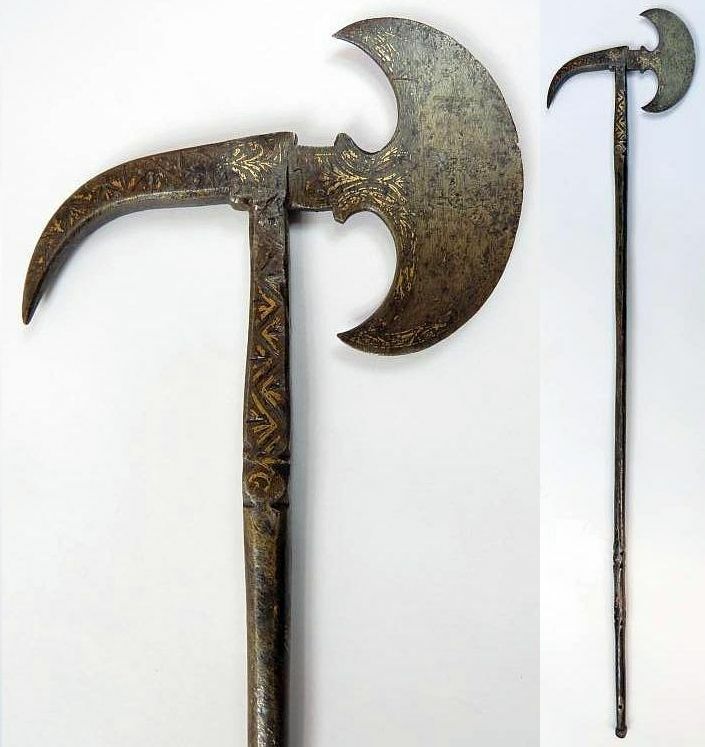 Shown with a similar Ottoman balta axe. 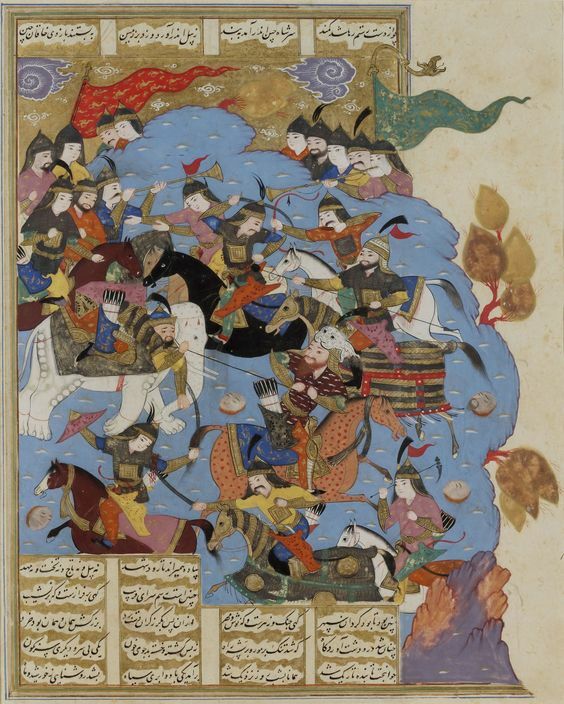 Rustem Pulls the Emperor of China off his Battle Elephant, from The Book of Kings’ the Shahnameh, Safavid, Persia Late 16th Century. Detail view showing a zaghnal being used by a Persian warrior. Shown with a similar Indian zaghnal. This is the only image I have ever seen showing what looks like a zaghnal in use. This image would date the zaghnal to the late 1500s. 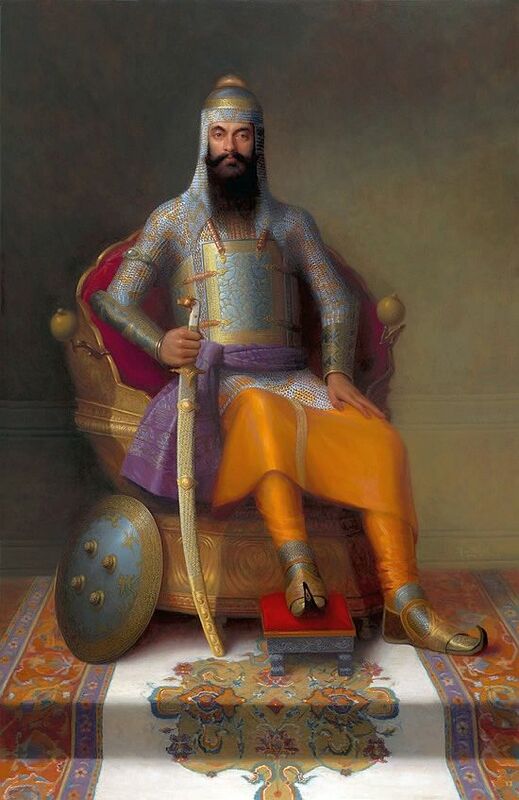 Since the zaghnal is seen as being an Indian weapon either it was known and used in Persia at one time or possibly the image was created by an Indian artist who was familiar with the zaghnal, as Indian artists are said to have worked on some Persian illustrations from around that time period. Last edited by eric t; 07-04-2018 at 11:49 PM. 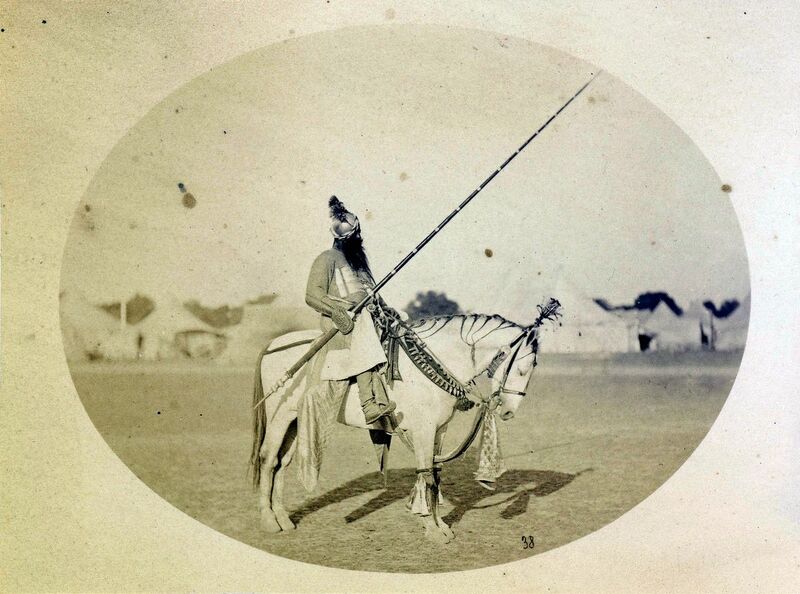 Afghan military sword, shown with a picture of Afghan General Daod Shah wearing a similar sword, late 1800s.